The week of action to #StopDSEI involves days of talks, events and direct action. Alongside the themed days of action, there will be a tent based occupation running from Monday 4th to Sunday 10th September. If you have to travel far to join the week of action, you might want to bring a tent and enjoy the September weather! During the 2015 week of action to the Stop the Arms Fair we camped on a small grassy bank that sustained us for the duration – in , fact the camp remained occupied past the final day of action as people wanted to stay on. You can see the video reports that Occupy made here, to get a feel for what camping at DSEI was like in 2015. This year, Occupy will be back for a week-long camp during the week of action, creating a friendly space for people to come and stay. If you’d like to join, then bring yourself, your camping equipment, and read our Camping at DSEI FAQ. You can also like Occupy the Arms Fair on Facebook for updates, and to follow the news from camp during the week of action! 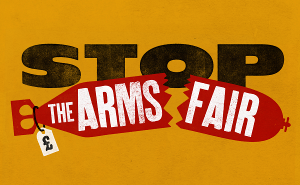 Like and share the Occupy the Arms Fair page on Facebook.